YOUR CARD HAS A NEW DESIGN! 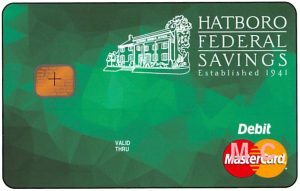 Hatboro Federal is excited to announce your ATM/Debit Card is getting upgraded to a more secure, MasterCard® Debit Chip Card! Your new chip card should arrive to you in the mail within the next few weeks. Using your new chip card in a chip-enabled terminal creates unique data for that transaction, providing an extra layer of protection for your account. Your new chip card brings this additional security at no cost to you. Protecting your accounts is our top priority at Hatboro Federal Savings. Your new debit card with the embedded chip provides the highest level of security currently available, and is the new standard in the U.S.
As you await your new chip card in the mail, we have composed some frequently asked questions about this new technology for your convenience. If you have any questions on chip cards or the security of your accounts, please contact us at 215-675-4000. Why is Hatboro Federal switching to MasterCard? MasterCard’s chip debit card program was reviewed and determined to be the best fit for our customers with keeping their security as a top priority. We will begin mailing chip cards within the next few weeks. If you currently have an ATM/Visa Debit Card open, you will receive a replacement debit chip card. Until then, continue to use your standard card with the magnetic stripe. Once your new card is activated, we will disable your old debit card. Please activate your new card as soon as possible because we will be deactivating all the existing debit cards within two weeks of receiving your new card. Most merchants will receive the new card number automatically, however, we cannot guarantee they make the change on their end. We strongly encourage you to reach out to any merchants that you have provided your card number to in order to ensure the information they have is accurate. Will there be any fees with the new card? Just like your existing debit card, your new chip debit card is free with your approved qualified deposit account. Will my spending limits change? No changes were made to your daily spending limits for both point-of-sale (POS) transactions and ATM withdrawals. Please refer to the Cardholder Agreement and Disclosure included in your mailing for further information. If I have an ATM card, why am I getting a Chip Debit Card now? Technology continues to grow at a rapid rate. Your ATM card is built on older technologies that are no longer considered a best-in-class secure manner. Transactions with your new chip debit card are more secure because of a unique process that is used to determine if the card is authentic. This makes the card more difficult to counterfeit or copy. Why does my Hatboro Federal debit card now include a chip? It’s easy. If the retailer has a chip-enabled terminal, simply insert the chip end of your card face up into the terminal. The chip card will remain in the terminal while the transaction is processed. To authorize your transaction, just follow the prompts as you do today. You’ll be prompted to enter your PIN or to provide a signature as you normally would to verify the transaction. You may not be asked for a PIN when travelling internationally. Your card will remain in the terminal until the transaction is completed. If the retailer is not equipped to read the chip card, just swipe as you do today. However, if you swipe your chip card at a chip-enabled terminal, the terminal may prompt you to insert your chip card into the terminal. Transactions made over the phone or online will not change.